Santa Barbara Orthodontist - Drs. Edstrom, Trigonis & Swenson | Kate, Our Frozen Contest Winner! Kate, Our Frozen Contest Winner! 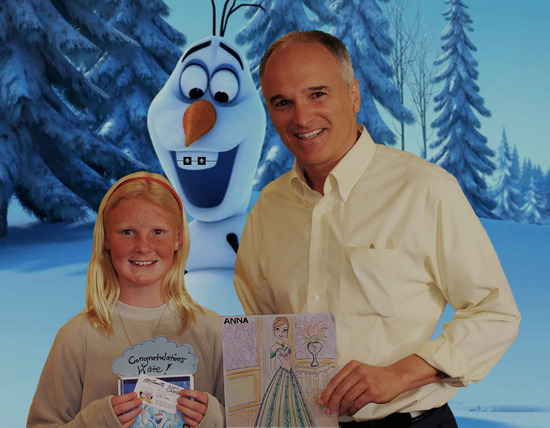 Congratulations to Kate, our “Frozen” contest winner! The contest was such a success that we had a hard time choosing just one winner. So we narrowed down the competition to 3 choices and finally chose 1 grand prize winner and 2 Honorable mentions. Kate, our grand prize winner, won a “Frozen” DVD and a gift card to McConnell’s Fine Ice Cream. Our two honorable mentions also won gift cards to McConnell’s Fine Ice Cream. Thanks to all our patients who participated!